Elliott Lemmon, a former light vehicle apprentice who trained with the MTA Institute and was the Institute’s 2017 Apprentice of the Year, is to head overseas to pursue a long-held ambition to work at the top levels of motorsport. The opportunity has come after the 21-year-old was awarded a scholarship from the Queensland Overseas Foundation (QOF). 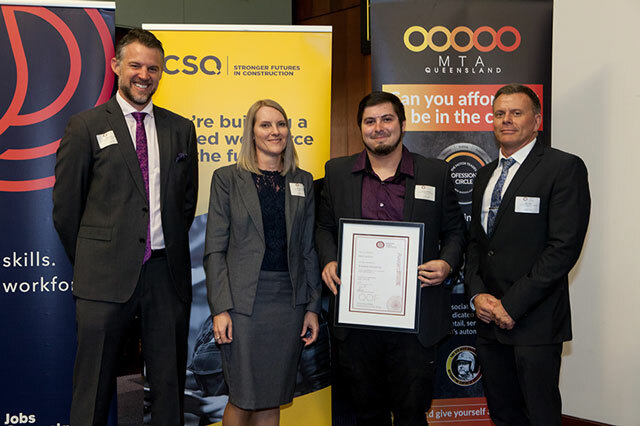 The Queensland Automotive Skills Alliance QOF Industry Partnership Scholarship is an automotive scholarship founded via a partnership between QOF, MTA Queensland, the Heavy Vehicle Industry Australia, the Institute of Automotive Mechanical Engineers and the Construction & Mining Equipment Industry Group. It is the first such scholarship to be presented by the Foundation and is designed to offer graduates in the Queensland automotive industry the chance to work abroad with the help of a $7500 fund. 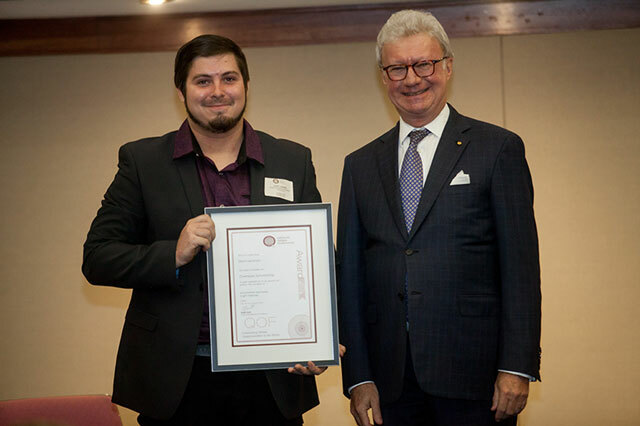 Elliott received the award from Queensland Governor Paul de Jersey AC at a special ceremony held at Parliament House in Brisbane. The scholarship comes at the end of a whirlwind couple of years for Elliott. 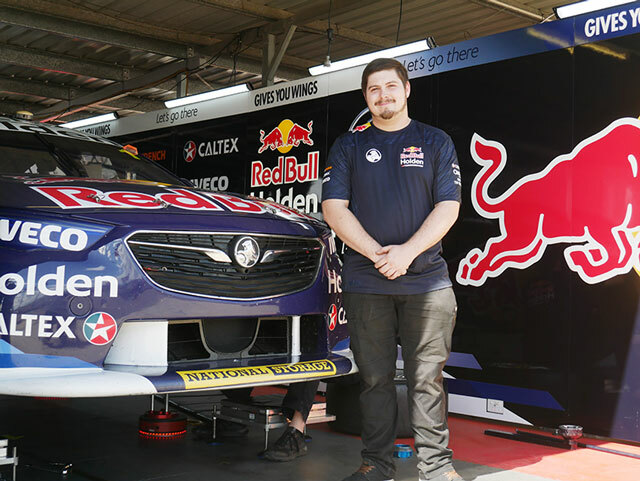 Back in October 2017, the then third-year apprentice won the MTA Institute’s Apprentice of the Year award and in the ensuing 18 months, on top of completing his qualification and developing his skills at various employers across Brisbane, he has been a pivotal member of the MTAQ Racing Team Support Crew and has had the privilege of working with the Triple Eight Supercar racing team outfit at their Banyo HQ as well as at the Ipswich and Gold Coast rounds of the Supercar championship. It has been a tremendous grounding for a young man with his sights set firmly on a career in the fast-paced (excuse the pun) and high-pressure world of professional motorsport. With the help of the QOF scholarship fund, Elliot’s hard work and ambition has paid off and he is making his first foray into the world of international competition – by the time you read this, he will be on his way to Malaysia to join the powerhouse racing outfit Absolute Racing, a team that operates from China, Malaysia and the U.S, and competes, and wins, in multiple categories across the region, including the Asian Le Mans Series, Audi R8 LMS Cup, Blancpain GT Series Asia, China GT Championship, GT Asia Series, Pirelli World Challenge, Porsche Carrera Cup Asia and Formula Masters Series. “I’ll bounce around a bit, but I’ll be a race mechanic based in Shanghai,” said Elliott when Motor Trader caught up with him after the QOF award ceremony. “The main series I’ll be involved in is the Blancpain GT World Challenge Asia Series, and that will mean races in Malaysia, Thailand, Japan and then Shanghai. I know I will be working those rounds and then we’ll see what’s next! “I never would have believed when I started my apprenticeship that I would be where I am today,” he added. “I am still very surprised and sometimes can’t believe it’s real. “I am not the most skilled mechanic, but I want to keep learning and I think people like that. I’ve never seen this career as a 9 to 5 job and there’s nothing like the immediacy, and the satisfaction and achievement, you feel in developing and improving a race car. The QOF Scholarship award will help Elliott to fund his international ambitions, and while the automotive scholarship is a new addition to the QOF, the Foundation itself has been around for more than 40 years, providing vocational education and training graduates and professionals with the opportunity to improve their career prospects by working overseas. Established in 1976, the Foundation is sponsored by industry and supported by the Queensland Government. Joining Elliott as this year’s scholarship winners were an electrical instrumentation technician, a make-up artist and a meat processing technician – all young graduates and outstanding examples of the benefits that vocational education and training can deliver. And that was a message underscored by the Governor of Queensland, Paul de Jersey AC, during his presentation speech at the scholarship awards ceremony. “For many decades, vocational education and training has played a pivotal role in the Australian economy by building knowledge and skills by helping people excel,” he said. Commenting on the competitive nature of the awards process, the Governor said that the four scholarship winners had distinguished themselves and were about to embark on an exciting journey. For Elliott, the next few months will be a sensational experience, and where will it lead is anyone’s guess, even for Elliott himself. However, he does know, with absolute certainty, that motor racing is where he wants to be, and for young people just starting out on the apprenticeship path, he had some sage words of advice. “I like to plan for the future, but when things this big happen it is hard to think where I might end up,” he said. “I do know I want to be around motorsport, and that’s always the way I have thought about it.